Guide to Good Eating for sale. Buy online at Zingerman's Mail Order. Gourmet Gifts. Food Gifts. A deeper discussion of great food. 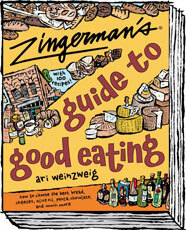 Zingerman’s co-founder Ari Weinzweig has collected stories, recipes and pearls of wisdom into this tome of culinary knowledge. A must for serious chefs and weekend cooks alike. Not only does the reader understand the ins and outs of formally mysterious foods like balsamic vinegar and great olive oil but also its approachable writing makes it easy to become an authority on practically all things artisan. Makes a great gift, especially when you buy a copy with a $25 gift card we'll include for just $20! Redeemable at any Zingerman's business and online.